Two simple words that said to a railfan or train enthusiast mean for some a familiar place, for some a quest akin to the Holy Grain, and for some, just a unique, timeless and special place. I was first introduced to Tehachapi Loop by the January 1977 issue of Trains Magazine. Back then, it was the Southern Pacific and Santa Fe railroads battling the hills and the curves. It was… well, it was captivating. Inspiring. A place I had to see for myself. A place I (naively) dreamed about fitting on a 4’x8′ sheet of plywood in HO scale. Tehachapi Loop is timeless, and on the Bucket List for many a photographer and railfan. It took over 22 years for me to get to Tehachapi Loop. Mrs. Frog was there with me, and once she was over the Loop, she politely tolerated my excitement. The Southern Pacific was in the process of being assimilated by the great yellow borg (a.k.a. the Union Pacific). The Santa Fe was disappearing into the BNSF. And the Loop was magnificent. To describe the loop is kind of hard. The reality is that the twists and turns are a result of the railroad needing to gain elevation in its’ climb from Bakersfield to the summit at Tehachapi. I’ve seen it explained as what would happen if you gave a youngster too much track for a small layout with instructions to use it all up. You just have to see it to appreciate it. While I am not a fan of double-stack container trains, they are a reality of railroading today. The often bright colors of the containers make it easier to see the train as it twists and turns heading east from Keene and Woodford. It took me another six years to get back to the Loop again. There were still vestiges of the Santa Fe left on that trip, but not much of the Southern Pacific. I left somewhat unfulfilled, as I didn’t have a wide angle lens that could capture the whole Loop in one shot. Fast forward to 2016. I finally had a lens that could capture the Loop – a Tamron 10-24mm zoom. I left the night before so that I could be at the Loop at first light – which, in my humble opinion, is the best time to capture the Loop. The air had a chill as I walked to the overlook and waited. And waited. And wished I had a jacket. And waited. I caught three trains that morning before the sun angle became too stark for my tastes. Mission accomplished, I left satisfied, checking one thing off of my list… (which isn’t to say I won’t go back!). 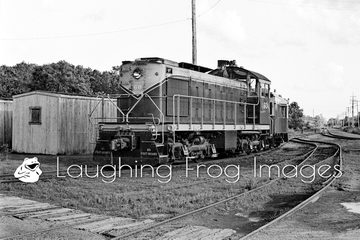 Those images are now in the Tehachapi Gallery on Laughing Frog Images. I don’t normally do this – but all of the images in the gallery are cropped to accentuate the Loop in formats from 1h:2w to 1h:6w. They’re different, that’s for sure. They’d make a great gift for someone, or a conversation piece on your own wall. And, even if you’re not in a buying mode, just go in and check out the images of something you can only see just west of the great little town of Tehachapi, CA. The images from 1999 and 2006 are yet to be scanned, but they’ll be in the gallery some day as well. If you find yourself on California Highway 58 between Mojave and Bakersfield, I invite you to make two stops: one in the town of Tehachapi – some interesting museums and things to see, and, of course, the Loop itself west of town. It’s partly cloudy in Terra Alta, WV. About a month ago, we saw Chessie System GP40-2 4162 in bright sunshine at Salt Lick Curve. That was two miles west – and down the hill. The weather can change dramatically between Rowlesburg and Terra Alta, let alone from any point in between. It’s partly cloudy in Terra Alta, WV on February 21, 1988. We’re at the Main Street crossing in Terra Alta looking west. We’re on the north side of the tracks, which puts this side of the train in a bit of a shadow. However, this view allows you to see where the world ends about 17 cars back. Well, the world doesn’t really end there – it just looks like it does. That the train disappears from view in such a short distance gives you an idea of what the grades are like on this line. 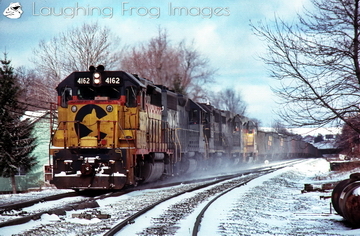 It’s partly cloudy in Terra Alta as Chessie System GP40-2 4162 leads an eastbound coal drag on 2/21/1988. Eastbound coal drags have a hellacious climb out of the Cheat River valley that ends here – the 4162 and sisters won’t notch back until the train has rejoined us at the top of the world. I haven’t watched a train pop up and enter Terra Alta in about 20 years. Time flies, but I digress. Way back then, it was quite a spectacle as you heard the train long before you saw it. The rumble of the prime movers and the whine of the turbochargers and fans (yes – a rumble and a whine at the same time) would get louder, and then you’d see the lead locomotive appear from top to bottom as it climbed over the edge. Within a couple of hundred feet of appearing, the whistle would blow for the Main Street crossing – exactly where would depending on how fast the train was going when it crested the grade. Fast is a misnomer, as that was typically somewhere around 13 mph. Mountain railroading isn’t fast railroading… If it gets to be fast railroading, then there’s probably going to be a problem… And yes, that’s unfortunately happened on the West End, and it’s cost some lives over the years. Things have changed on the West End. Yes, coal still moves east, but not as much due to factors and reasons far beyond the hills of West Virginia. Gone are the EMD GP40-2 and SD50 locomotives that dominated my time there. Quieter, more powerful General Electric locomotives predominate. I’ve heard that the informal road that used to be the third track that was a key element in making the images in the Chessie & CSX: The West End Gallery is now blocked by locked gates. The spectacle of man and machine versus nature still happens a couple of times a day. For how long remains to be seen. It’s possible to bypass the West End by running northwest to the Monongahela River valley, then north to the Pittsburgh area, and then east – but it may not be practical. Yet. It’s hard to imagine the West End gone, but it’s not safe by any means. 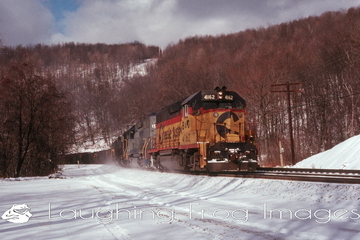 Just over 28 years ago – 2/21/1988 to be exact, there was sunshine and snow at Salt Lick Curve. Oh yeah, there was a train there too! Sunshine, snow, and Chessie 4162 at Salt Lick Curve west of Terra Alta, West Virginia. Click on the image to be taken to the Trains Gallery. Chessie System (B&O) GP40-2 4162 leads a train of coal cars east from the bituminous of West Virginia. She’s been climbing Cranberry Grade out of the Cheat River Valley in Rowlesburg towards the summit at Terra Alta at speeds in the high teens. Cranberry Grade is part of the storied West End of the Baltimore and Ohio Railroad (now part of CSX). It’s a battle of machine versus nature on this beautiful February day. Sunshine and snow at Salt Lick Curve happened more often than sunshine, snow and a train came together at Salt Lick Curve, so I’m glad I was able to capture this. There are three SD-50 locomotives with their collective 10,500 horsepower pushing on the rear of the train. Hard to believe that the 13,500 horsepower on the front of the train needed assistance, but that’s the West End for you. This area of West Virginia and neighboring western Maryland can have absolutely brutal weather in winter. If you’ve ever heard Oakland, MD mentioned during a weather report, this train is on its’ way there. It was gray and cloudy at the bottom of the hill in Rowlesburg. The weather at Terra Alta was like it was at the bottom, just maybe a little brighter. I don’t have any notes as to the temperature that day, but I do have pictures of the MK Helpers (the SD50s) east of Amblersburg and the train cresting the hill at Terra Alta that might make it here to complete the story. Fortunately, the trains don’t move all that fast uphill, and I didn’t miss the chase. This image is not yet on Laughing Frog Images. It will make it to what will probably be a gallery devoted to the West End. It’s 80-something degrees as I write this, and when I came across the image and saw the date, well, it just called to me to be shared. Scanned from a Kodachrome 64 slide using a HP S-20i scanner at 2400 dpi. Snow, palm trees and a train are not three things you would expect to see in the same picture – but they’re here in Snow, Palm Trees and the Local. I don’t know how many places that it is possible to capture such an image. There are certain days that it is possible in La Verne, California – it just takes the convergence of Mother Nature and BNSF to make it happen, as the palm trees are there every day. The snow is on the peaks of the San Gabriel Mountains north of La Verne and San Dimas in the background. The palm trees are in a yard and on the grounds of the Metropolitan Water District of Southern California. The Local is shoving a tank car of chlorine north on the MWD spur that leads to the F. E. Weymouth Treatment Plant. This movement happens roughly once a week. If you consider that there isn’t snow on the mountains on a regular basis and that the train can typically be seen here just once a week, you come to realize that this is a rare shot indeed. All that said, I really wish that this consist was reversed and the 151, still sporting her red and silver warbonnet paint, was in the lead instead of against the train. Snow, palm trees, and the BNSF Pasadena Subdivision Local in La Verne, CA. 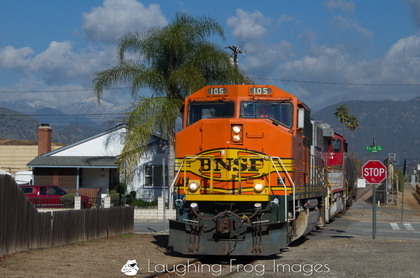 Snow, Palm Trees and the Local can be found in the BNSF ex- Santa Fe Pasadena Subdivision gallery on Laughing Frog Images. The Blizzard of 1996 appears to have been surpassed in the record books by the Blizzard of 2016. I have to admit that there’s a part of me wishing I was back east for this. And there are many of you now thinking that I’ve totally lost any shred of sanity that I might have still had. Rest assured that I haven’t. For you see, the only way that you can photograph a train (or anything else for that matter) in the snow is to be out in the snow. Makes sense. At least to me anyway. So, a long time ago (January of 1996 to be exact) in a galaxy far, far away (Hancock, WV and environs), there I was with a cohort driving down a road that I’d never been on before. We had a four wheel drive Ford Explorer, so that was a good thing. Did I mention that the roads weren’t plowed? That I couldn’t tell just exactly where the road was? That this was long before cell phones? None of that mattered, because the Blizzard of 1996 had finally ended, and there were trains to be run. Lots of them. Trivial little things like unplowed roads and and not exactly knowing where the roads were in many cases weren’t going to get in the way of the images to be made. We’re at HO Tower in Hancock, West Virginia to witness one of the first eastbound freights to move in a couple of days pass through the interlocking plant. The snow isn’t as deep here, as CSX Maintenance of Way forces worked throughout the night to clean the snow from the switches so that trains could run through the plant. HO Tower is on the CSX Cumberland, MD to Baltimore, MD former Baltimore and Ohio Railroad Main Line. There were still a series of towers in use at this time – local switches and signals were controlled by the Operator (the person who worked in the tower). Some of the Operators stayed in their towers for extended shifts during the storm, as there was no way out while everything on rails and wheels couldn’t move. These days, there aren’t a lot of towers left – for the most part, train dispatching is now handled with the assistance of computers in a windowless room that may not even be on railroad property. But that’s another story, and another post. 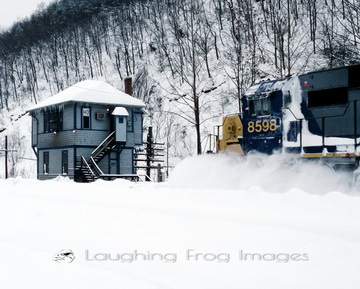 CSX SD50 #8598 kicks up a nice plume of snow as she leads an eastbound freight past HO Tower. There isn’t a gallery up for the Blizzard of 1996 on Laughing Frog Images just yet. There’s a lot to scan and process, but there will be a gallery. Someday. For now, we’ll all just have to enjoy this image. An eastbound CSX freight train kicks up the snow as it passes HO Tower in Hancock, WV after the Blizzard of 1996. It’s a long train! BNSF 7195 West. Being from the Mid-Atlantic states, being able to capture a whole train in one image was something that just didn’t happen. At least with normal sized trains. One of the things I enjoy about the BNSF ex- Santa Fe Transcon Line in northern Arizona is the ability to catch a whole train in a shot. Milepost 302 on the BNSF Seligman Subdivision is one of my favorite places to do this. The lighting is perfect for about the last 30 minutes of daylight when the sun is just above the horizon. You can see a westbound crest the hill just west of the Highway 99 Exit to Leupp (don’t ask me how to pronounce that properly) and photograph it over the course of a couple of miles. The train drops down a slight grade, enters a curve to the left, disappears from sight, and then pops up as it continues to climb towards you. As it nears you, it enters a right-hand curve and if you catch it just right – you’ve got sunlight that’s hitting the train almost perpendicular. This is what is known as “golden light” or “sweet light”. BNSF 7195 West. Milepost 302 Seligman Subdivision. 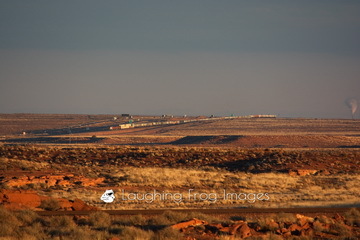 Click on the image to be taken to the BNSF ex- Santa Fe Lines Gallery to view the series. This is one of the first shots of the series described above. I chose this picture, as it shows just how “big” northern Arizona is. The engines are over four miles away from me. The train itself is over a mile long (don’t ask just how long – I lost my note). The smoke in the distance is from a power plant nearly 40 miles east in St. Joseph City. It’s big country… It’s a long train! The light couldn’t have been much better, as the sun dropped below the horizon four minutes after the last shot. While I wish I could have been at this location about 20 years ago when the trains were headed by Santa Fe’s Superfleet power in the classic red and silver “Warbonnet” paint scheme or the blue and yellow “Bluebonnet” scheme, I’ll take it. Image details: tripod, ISO 800, 1/640 second, 500mm. There’s much more to add to the BNSF ex-Santa Fe Lines Gallery as slides get scanned and scans and images are processed. Thanks for visiting. Be sure to check out Laughing Frog Images for help on covering up that blank space on your wall. On June 28, 1981, the Chessie Safety Express pulled by C&O 614 made a round trip from Akron, OH to Pittsburgh, PA via the Baltimore and Ohio main line. I didn’t realize how harsh the lighting was for many of these images until I started to work on them. The gray sky for most of the day wasn’t helping things either. So, this became a black and white gallery for the most part. The black and whites mimic the profile for Kodak Panatomic X film. And, there’s nothing wrong with images of a steam engine in black and white. Some would argue that it’s only right and proper. As I put the gallery together, it hit me that this isn’t just a train gallery, it’s also a history gallery, as much has changed and much is gone in 35 years. JO Tower in Akron is gone. The tracks to the left of the train at JO are the former Erie / Erie Lackawanna mainline to Chicago. I believe they’re gone now. At Edinburg, you can see the four-track signal bridge of the Pittsburgh and Lake Erie spanning the two remaining tracks. Centralized Traffic Control made the other two redundant. The downfall of the domestic steel industry later made the P&LE itself redundant. At Eidenau, you’ll see that the block signal is sitting in the middle of the former eastbound mainline. CTC had just been installed on the Pittsburgh and Western Subdivision. The station at Bakerstown wasn’t long for the world at that point in time. Bakerstown Hill was a pain to the B&O – heavy trains in either direction (particularly westbound freight trains out of Glenwood Yard) required helpers. The P&W is now split between the Allegheny Valley Railroad and the Buffalo and Pittsburgh Railroad. C&O 614 hasn’t turned a wheel in a while. 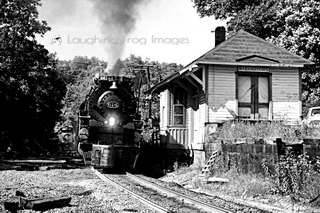 You can visit the C&O 614 Akron to Pittsburgh gallery on Laughing Frog Images by clicking here. There are a couple more C&O 614 galleries to come in time for you to order for the holidays, and they include perhaps my favorite images of her. Getting any gift ideas yet? I finally got around to uploading over 70 black and white images of the PH&D in black and white, and a couple of the GTW and Amtrak in Port Huron, to the galleries. These images represent most of what is found in the Frog’s second book – “The Port Huron & Detroit Railroad in Black and White 1984“. I struggle with admitting that I found my black and white work to be more stirring and evocative than my color work. I still can’t explain that to myself. Perhaps it’s the nostalgia that black and white photography brings with it. A connotation of times past? I don’t really know, but it stirred me as I was scanning the negatives and working on the book. And it still does. I spent a great deal of time working on fixing 15+ years of less than ideal negative storage. It wasn’t until sometime around 2000 that these negatives found a home in archival plastic pages that then made their way to binders for flat storage. They’re still not perfect. As I mention in the gallery commentary, if you want to order a certain image, and notice that there’s something I missed, please let me know and I’ll fix it and report the image. I just reached a point where it became apparent to me that some people really want to see these images, and they can’t do that if they’re stuck on my computer. As I write this, I’m looking at the image above and there’s a part of me saying “get rid of that pole and the wires above the engine!” I don’t know why that thought came to me now. And there’s a part of me saying “but that’s not how it was – so just leave it alone!” And that’s the part of me that’s winning. All of that said, if there’s anyone that does want the pole removed to make this “THE” PH&D in black and white image for you – let me know and I will take it out (and add a disclaimer to the caption for the sake of being honest!). All of that said, as I look at the picture more, it occurs to me that there is so much in this image that speaks. The trackage itself tells a story – these are the roundhouse leads. The wood-sided buildings. Old naked ties where there once was a track. The PH&D main fading off into the distance. The Detroit Edison power plant in Marysville off in the distance (it’s gone now). And then, there’s the main subject. ALCo S-2 # 60 and her caboose. There’s the last light of the day softly and evenly highlighting the details on the 60. The pole hanging by the cab speaks of an earlier time, but the “No Foot-Board” reminders and rotary beacon on the cab pull us into the 1980’s. I didn’t get all of what this picture said 31 years ago. I’m not sure I get all of what it says now. If I keep going, I might test the saying that a picture does in fact say a thousand words. But that might bore you. So, I’ll stop now and invite you to check out the Port Huron and Detroit in black and white as seen in 1984 on Laughing Frog Images. Half of all profits on products from the PH&D galleries go to the Port Huron and Detroit Railroad Historical Society to support all that they do. For each PH&D book sold through Laughing Frog Images or our CreateSpace Store, $5.oo is donated to the PH&DRRHS. PH&D in black & white published! Yes, I know, the Frog and the blog have been quiet lately. Two reasons. First, the day job that helps keep this going has been very, very hectic of late. 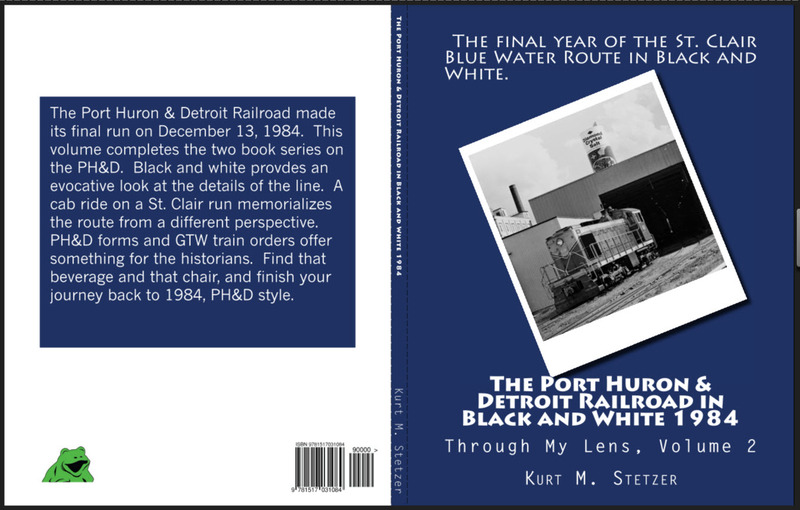 Second, “The Port Huron and Detroit Railroad in Black and White, 1984” is now available on CreateSpace via Laughing Frog Images and also through the Port Huron & Detroit Railroad Historical Society at their events! For every book purchased through Laughing Frog Images or the Frog’s CreateSpace e-store, a $5.00 donation will be made to the PH&DRRHS. The donation also applies to the PH&D and Connections in Color when purchased through those channels. The black and white book concludes the two-book series on the PH&D if for no other reason that I’ve now shared and published everything I have that’s worthy of sharing. The PH&DRRHS’s HoboFest starts on September 11, so I’d been working to meet that delivery deadline most every spare minute I had the last few weeks. That aside, it really was quite an experience to revisit the past and the PH&D in black and white. I never shot that much black and white. I was never that enamored with it, even though I am a great admirer of the works of O. Winston Link, Jim Shaughnessy, J. Parker Lamb and others. Maybe it’s because they shot “then” while I was shooting “now.” In 2015, “now” is “then”, and maybe that’s part of why this book hit me in a way I hadn’t imagined. There’s just something about seeing the PH&D in black and white that’s very different than seeing it in color. I can’t explain that either. I don’t know if this makes any sense, but I “see” things in my black and white work that I didn’t “see” in my color work. I hope that the readers feel the same way. You might has well have figured that this was coming given the recent videos and NJT gallery update! There were some firsts in my brief time on the platform waiting for my train. Besides the NJT ALP-45DP, I saw and photographed my first Amtrak ACS-64 locomotives. There was probably two “lasts” that day as well – my final video and still images of Amtrak’s AEM-7 locomotives. As the ACS-64s arrive, the AEM-7s are being put out to pasture. In the above photo, we see Amtrak’s Siemens ACS-64 pulling a northbound into the station as a Bombardier ALP-45a pushes a NJT train south. If those names don’t sound familiar to you, or sound”foreign”, there’s a reason. These locomotives are based on European locomotive designs, as there isn’t a sufficient market (or cohesive transportation policy) here in the States for the domestic manufacturers to create and maintain an off-the shelf domestic locomotive design. Fittingly, at least to me, was that my southbound Northeast Regional Train was pulled by AEM-7 917. As she drifted into the station, there was still enough sun left to capture her in pixels, and that image is in the Amtrak on the Northeast Corridor Gallery on Laughing Frog Images. In all likelihood, that was my last ride behind an AEM-7. Despite being over 30 years old, she was earning her keep that day, and I clocked her over the century mark (100 m.p.h.) more than once on my journey. Amtrak donated AEM-7 to the Railroad Museum of Pennsylvania, so they won’t go the way of Alco’s C-628 and numerous steam and electric locomotives that either live on in recycled metals or are forever gone. For the curious, all of the new images started as a .dng file from my Icon smartphone. Thanks for looking! And think about what a cool coffee cup this picture would make for you or the railroad enthusiast that you know… If this one doesn’t catch your fancy, there’s more in the Frog’s galleries!